Cysts are pockets of fluid that develop under the skin. While they are most often painless and harmless, these lumps can be a source of cosmetic concern when they form on the face. At the office of Dr. Sanaz Harirchian, we are proud to help patients regain a confident and smooth complexion through facial cyst removal surgery and treatment. Dr. Harirchian’s expertise in cosmetic and reconstructive surgery ensures that scarring and other skin flaws are greatly minimized after removing your cyst. She uses conservative surgical techniques that produce ideal results and optimal healing. Cysts can exist in various sizes and places on the body. Facial cysts may be classified as sebaceous or epidermoid. In either case, it can be uncomfortable as well as impact one’s self-esteem as it grows to become a distraction from the surrounding facial features. A facial cyst will need to be removed and confirmed as a benign lump, but many patients prefer an experienced plastic surgeon in order to avoid a lasting visible scar after surgery. Sebaceous cysts, a common type of facial cyst, develop when the oil-producing glands of the skin become blocked. Fluid accumulates at the clogged duct of the sebaceous gland and forms a harmless cyst. Unfortunately, these types of cysts can grow large enough to cause distortion and discomfort within the face. Complete removal or excision of the cyst is necessary to prevent the cyst from developing again. Dr. Harirchian uses the highest level of precision and care when removing sebaceous cysts so that your healing involves a fading scar and seamless restoration of the skin. Epidermoid cysts, also known as keratin cysts, tend to appear as hard small lumps on the face. Again, these cysts are typically benign and do not usually produce pain. However, like other facial cysts, an epidermoid cyst can be an aesthetic concern. They not only disrupt a smooth and even complexion, but they can also be yellow or tan in color, which makes them even more noticeable. Epidermoid cysts can sometimes go away or shrink on their own, but it can be difficult to predict when or if this will happen. Surgical removal is the best way to address this concern so that it does not reappear in the coming months or years. While there is no way to determine the exact cause of all cysts, many facial cysts develop after the skin is damaged in some way. This can involve a skin infection, damage to the sebaceous gland duct or even acne. 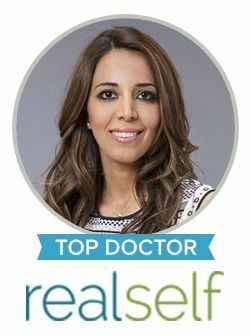 Regardless of what causes your skin growth, you can trust Dr. Harirchian to utilize the advanced excision techniques it takes to remove your cyst without leaving an obvious scar. If you have an epidermoid or sebaceous cyst on your face that is bothering you, contact Dr. Sanaz Harirchian in Houston. Dr. Harirchian is an expert at integrating art and science, using the most advanced and cutting-edge techniques for facial cosmetic and reconstructive surgery. She believes in a minimally invasive, maximally effective approach and a patient-centered treatment plan throughout every type of procedure.